The summer vacation is the best period of the year for a lot of people, so naturally I’m excited about a slot like Summer Holiday. It’s one of the titles released by Microgaming, and they’ve managed to make it not only fun to play, but also to look at. Its design is a strong advantage it has over the competition, but there are some cool features as well that should be tried. 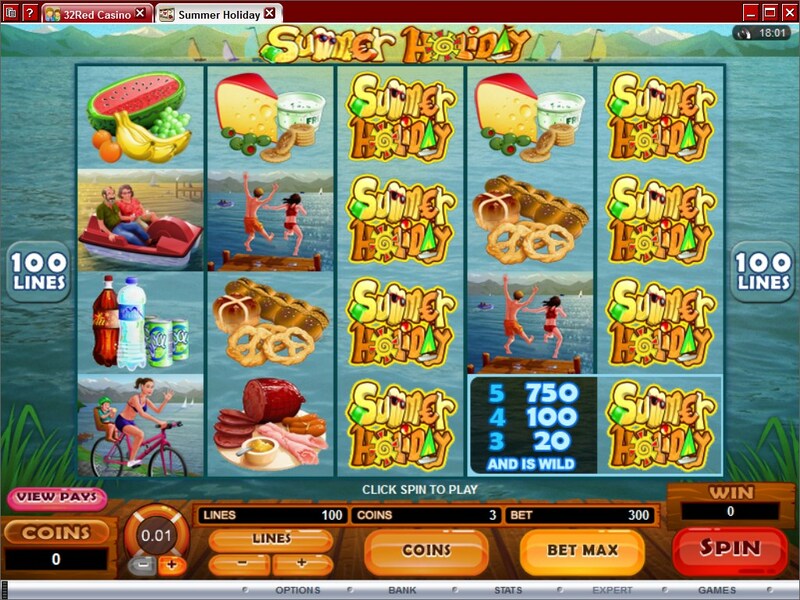 As far as slots with paylines go, there aren’t any that will offer more than this slot does. 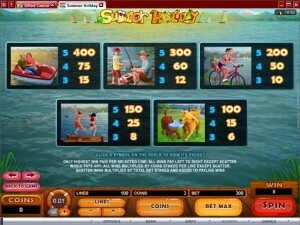 With 100 paylines used, the game has four symbols on each of the 5 reels, instead of the more common three symbols. You will get some great free spins, where if you’re not satisfied with the prize you can start over or risk it all, plus you have the usual scatter symbols, multipliers and the stacked wilds. With this many positives, it’s no wonder that a negative is also present, and it’s the top jackpot’s value, which goes only up to $375. Pretty much every feature from Summer Holiday has something extra to give you, so you’re going to get the wilds in stacked mode, while the scatter symbols trigger free spins with multipliers, plus a second chance in case you’re not satisfied with the results the first time. First, let’s look at the stacked wild, the symbol which can cover between one and four positions whenever it is visible. It is allowed to appear on all the reels and it can be part of its own combinations. Since so many of them can be present at the same time, you get a chance at a lot of five symbol combinations at the same time. 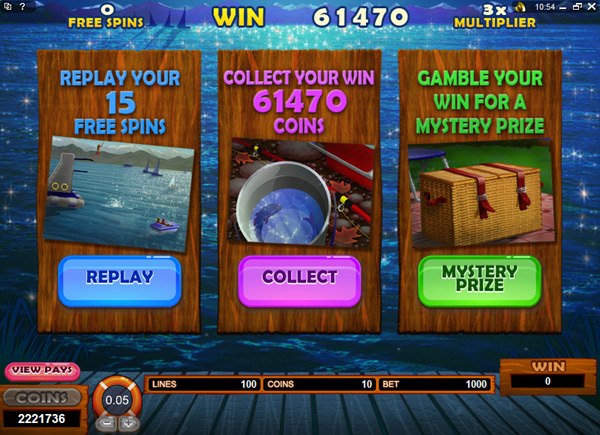 Each one gives you 750x, and in theory you could win up to 750,000 coins with a maximum bet. Stacked wilds are present both during the free spins and in the base game. As for the substitution ability, it’s used like in every other slot, giving you another chance at forming a combo of regular symbols. Next on the feature list would be the scattered Duck. The power of a scatter allows it to form its own type of combinations, without the symbols being on the same payline. You only need between two and five Ducks present, and in exchange you get a prize. 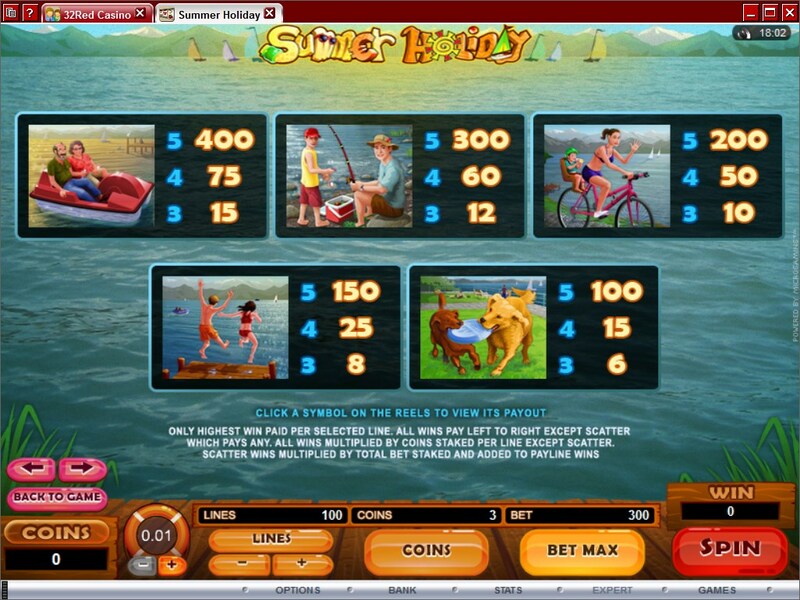 It’s cash, between 1x and 200x the wager, plus you have free spins as well. Duck symbols which appear on the reels will give you access to the free spins, but only if 3 or more are present. 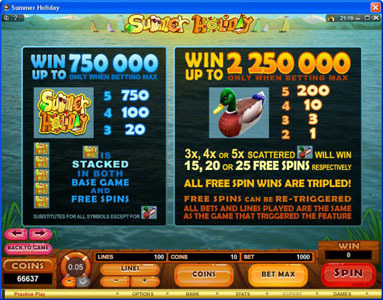 You get the minimum of 15 free spins when 3 Ducks are scattered on the reels. 20 spins are awarded for 4 scatters. 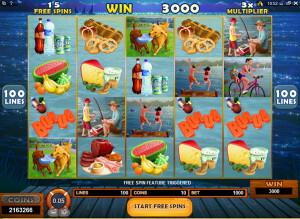 The maximum of 25 free spins are given for 5 symbols. 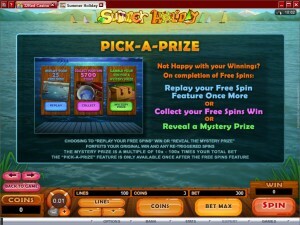 The wins offered during these free spins are worth three times more, a 3x multiplier being applied each time. 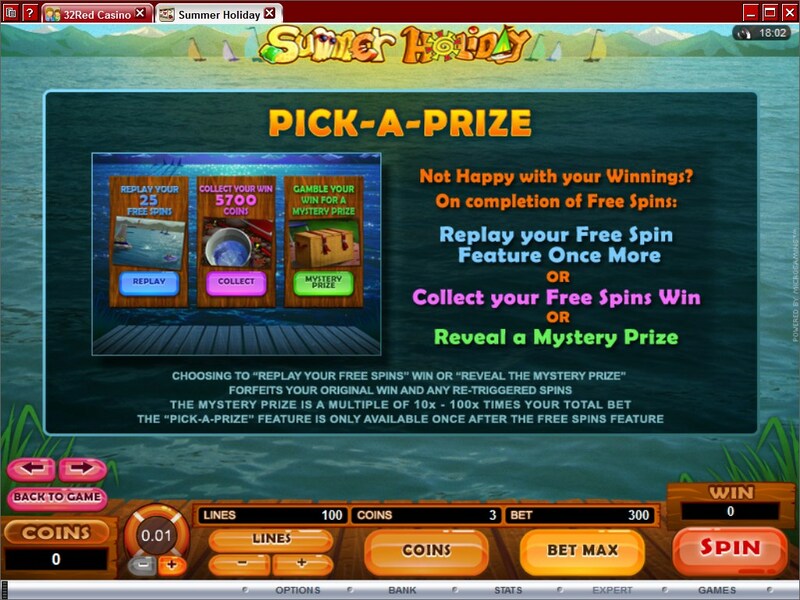 Now, once the free spins are over, you don’t get the money immediately. Instead, you’re given three choices. You can collect your winnings, you can replay the free spins or you can gamble it all in exchange for a mystery prize. You have to cover 100 paylines with your bets if you want to have them all active, and yet you only wager up to $50 per spin. That means a line bet of only $0.50 at its highest setting, where it uses 10 coins of $0.05. The wild symbol will give you a top prize of 7,500 coins, or 750x the line wager. With the coin denomination being $0.05, the jackpot is worth $375. It might seem like a very low payout, but consider that with 100 lines there are a lot of potential combinations that can be formed each round. Summer Holiday comes with its own gorgeous design, one which you’re not going to see that often. There are various characters enjoying their summer holiday, including an older couple, a girl with her baby and two teenagers. There are 100 paylines, so you have a lot of chances to create combinations. On them, a large portion of the symbols show you various types of foods that you might try during breakfast. Symbols: Summer Holiday Logo (wild, 750x), Duck (scatter, 200x the bet), Pedal Boat (400x), Fishing (300x), Biking (200x), Jumping in water (150x), Dogs (100x), Meat (80x), Drinks (70x), Cheese (60x), Fruit (50x) and Breads (40x). I’d play it for the large number of small wins that you get, to have a bit of fun and feel good. The design is great, the features are plenty of fun, but the prizes are very small, though that’s to be expected. 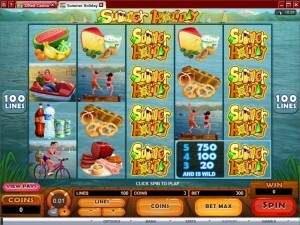 Summer Holiday can be found at any Microgaming casino, where you get a chance to play it for real money or in free mode.